In the early 1900’s the world-famous sculptor Auguste Rodin was observed at a museum in Madras, India performing various yogic poses as he stood in front of a statue of Nataraja (Shiva performing a cosmic dance – shown here). In fact, Rodin was nearly arrested for performing his strange contortions as the local Indian patrons and the museum guards looked on in horror, at the strange foreign man – who was moved to tears by the statue – deforming himself publicly. This is the story told by V. S. Ramachandran in chapter 8 of his book, The Tell-Tale Brain. In this chapter, Ramachandran explores the brain systems that underlie our aesthetic experiences – the aesthetic jolt – as experienced by an enraptured Rodin, at the sight of the dancing Shiva. There is much brain science and biology at work here (more posts to come). For the moment though, just consider how deeply moved was Rodin by Shiva’s physical forms. He wrote a poem, “The Dance of Shiva“ (covered here). A master sculptor, and expert on human anatomy, Rodin’s poem reveals his deep sense of bones and musculature and is even echoed today by yoga instructors who prompt students to remain strong and poised while softening the face and emotions. 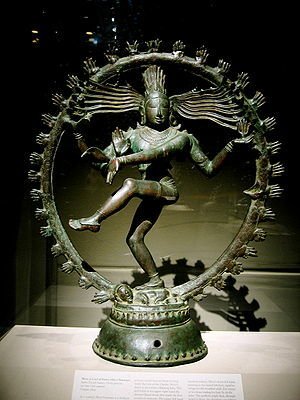 He declared the dancing Shiva, “the perfect embodiment of rhythmic movement”! Ramachandran explores the brain circuitry that we use when we feel the ecstasy of an aesthetic jolt – the kind that leaves us “spinning away into the heavens”. Its an ability we all have – to feel free – & I hope I can learn to tap into it. Yoga – with its bizarre and exotic forms – and meditation may provide a means to explore this aspect of life. Another way that I’ve been learning about this, and focusing on it in my daily meditation and yoga practice is to practice feeling great joy. Not by doing postures…but by letting feelings come through, and learning to accept those that I had previously suppressed or avoided. Somehow we don’t easily accept joy, and place limits on how much is acceptable. Rodin has been one of my favorites for a long time, so it is exciting to hear he was a yogi as well! I used to feel that aesthetic jolt so profoundly. Be it looking at a flower, walking through a garden, or viewing a beautiful sculpture; whatever it was, I felt it. At this point today, I don’t feel it. The past 2 years have taken me in a spin towards losing that sense of beauty through illness, stress, emotional trauma, etc. Isn’t that interesting that is can just go away without a trace?! I really truly hope I can activate it again through healing and mindfulness. Yoga asana is a main way for me to access it again.